This book is more than a cookbook! It is a cookbook designed to help you change your eating habits and live a healthier life. 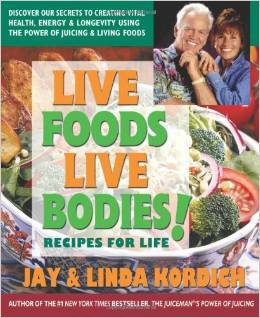 The authors, Jay and Linda Kordich, have spent decades of their lives perfecting their eating habits and healthy lifestyle. Jay Kordich, also known as "The Juiceman", is perhaps more famous for his love of juicing and has sold close to a billion dollars in juicers. As the title of this book suggests, they believe that eating raw foods-or foods that are alive-offer the best chance for living a long, healthy life. And Jay, who is now over 90 years old, is living proof! The first 80 pages of this book is text explaining their stories, philosophies, and how-to get started on a live food diet. Part one of this section is titled, "Understanding the Power of Living Foods." And part two is titled, "Following the Living Foods Lifestyle". Both sections are very detailed and offer many helpful hints including a living foods shopping list and how to set-up your kitchen. The final 152 pages of this book contain their "Living Foods Recipes." The first section, Basic Recipes, are recipes designed to get you started on a living food diet. For example, two recipes in this section are John's Basic Living Spaghetti and Basic Living Pie. Other recipe sections include Super Salads and Dressings, Living Soups, Cooked Choices, Juice Therapy, Living Nut Milks and Smoothies, as well as Dips and Spreads. Overall, the many raw recipes and instructions in this book will inspire anyone on their quest to a healthier lifestyle.